Roundtable Discussion: With Dwane Casey Gone, What Does the Future Hold for the Raptors? Roundtable Discussion is a new feature of the site. This segment focuses on a series of sports issues involving the NBA, MLB, NFL, NHL, collegiate athletics and much more. In the fifth episode, writers Steven Abramo and Sam Hengeli discuss the future of the Toronto Raptors. Steven Abramo: Just like the title reads, we’ll start this off with the Toronto Raptors’ difficult, yet complicated decision of parting ways with head coach Dwane Casey after seven seasons. You should know the story by now. How Casey guided the Raptors to 59 wins (most in franchise history), knocking off good teams, and smashing great ones in the regular season. He rebuilt Toronto’s brand, focusing on more three-pointers while crafting a deeper bench. As a whole, Casey made the Raptors faithful believe that they had a viable roster, strong enough to withstand the force of LeBron James, and the rest of the Eastern Conference. Unfortunately, LeBron and the Cavaliers swept Toronto in the Eastern Conference Semifinals, squashing the Raptors’ playoff aspirations for another season. Their recent loss marked the sixth time in Casey’s Raptor tenure that he failed to reach the Conference Finals. But in fairness to Casey, facing LeBron in the East rarely yields a positive result. So, was Casey fired because his team couldn’t beat the greatest player of this generation, or is it the fact that he just wasn’t good enough to get the job done when it mattered the most? Sam Hengeli: Casey was fired because he couldn’t beat the greatest player of this generation. That’s simply what LeBron can do to a franchise. I can’t blame Casey entirely for this playoff failure, though. In Game 1, Toronto had what seemed like 100 chances to close it out, but botched layups and poor play from Kyle Lowry and DeMar DeRozan down the stretch doomed the Raptors. Casey threw different looks in Game 3, benching DeRozan for the entire fourth quarter and sticking with rookie OG Anunoby, who played the best game of his playoff career that night, hitting a clutch game-tying 3. The Raptors were the #1 seed for a reason, and they set the record for the most wins in franchise history in 2017-18, so they obviously showed they had the talent and team to make it out of the East. However, they don’t have that transcendent talent to knock off James. If they had such a player, then I’d think they would have advanced. Steven Abramo: Toronto’s recent playoff set-back revealed that even though the Raptors rebuilt everything, it wasn’t as sturdy as they envisioned. So, what is Toronto’s next step? Do they continue to add pieces around Lowry and DeRozan, or is it finally time to blow it up? Both decisions come with consequences, but more so with the latter. Blowing it up doesn’t always get you what you want. Sometimes, a hard reboot is beneficial, providing a team with a surplus of high draft picks to (something the Raptors don’t have) to build around for the future. This type of approach can win games in a quick span, like say Philadelphia, who has a bright future thanks to top picks Ben Simmons and Joel Embiid. However, there are drawbacks to a rebuild. Oftentimes it takes an additional 5-6 years to actually reach .500, and even then, there are no guarantees (just ask the Orlando Magic). Sam Hengeli: Toronto should see what Lowry and DeRozan are valued at this off-season. The Raptors can trade either to the Sixers for this year’s pick, Markelle Fultz, Robert Covington, and Jerryd Bayless. This opens up their window in a couple years. But if they can’t anything to help them contend, then I would say it’s time to rebuild. Face it, the Sixers and Celtics are only getting stronger and have very bright futures. What we also have to consider is LeBron James’ decision this July. This could shift the entire landscape of the NBA. The Raptors must be smart about their rebuild. They need to hit on all their draft picks, even the ones in the late first and early second rounds. Steven Abramo: Let’s move to a more positive outlook. Despite Toronto’s uncertain future with Lowry and DeRozan, they do contain a set of promising stars. 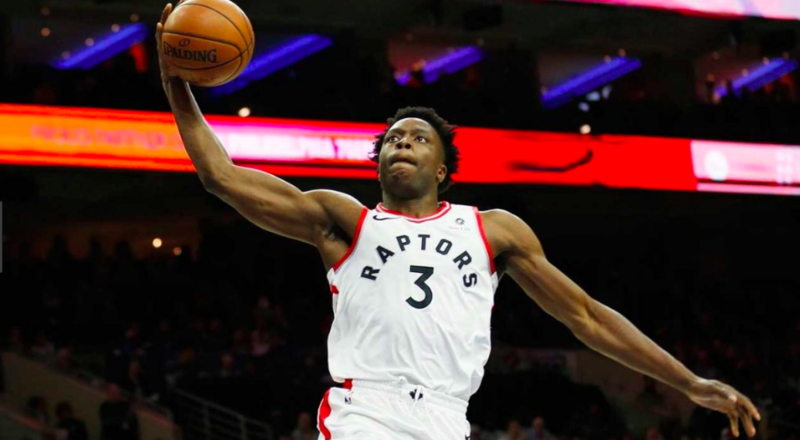 OG Anunoby is 20 and has shown the potential to defend up to four positions. Fred Van Vleet just finished his second-year in the league and is already a productive guard off the bench, shooting for a high percentage, and is also plus defender. And then there’s Pascal Siakim and Jakob Poetl, two versatile bigs who can continue growing in the Raptors’ second unit. In your opinion, how are their ceilings? Sam Hengeli: OG’s ceiling is very high to me. He could be the next Kawhi Leonard (I know this is a stretch) in terms of his defensive impact and three-point shooting. For Van Vleet and Poetl, I see them as fundamentally sound role players. Van Vleet brings a decent amount of offensive production with his outside touch and down-hill driving ability, and Poetl is just a high IQ big, who can bring toughness in the interior. Although both won’t make the All-Star team, they are pivotal pieces to the Raptors rebuild. 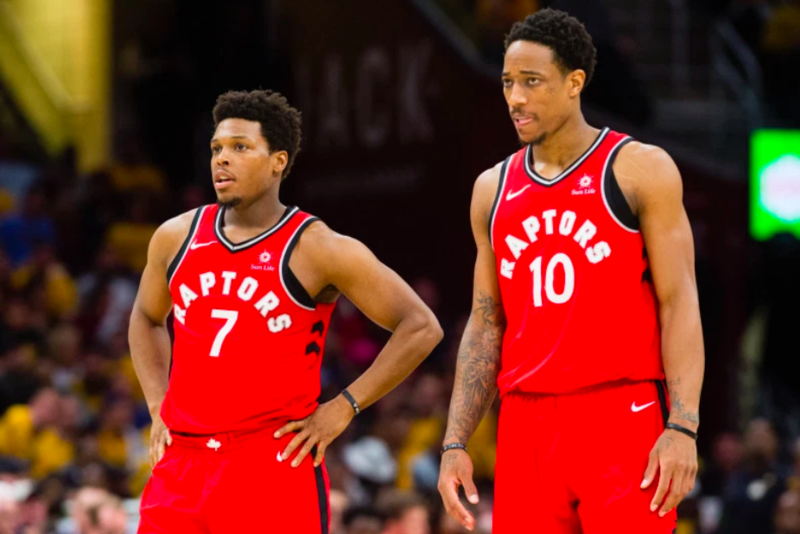 Steven Abramo: Lastly, if this was Toronto’s playoff last ride, what should be Casey’s, and if they get traded, Lowry and DeRozan’s lasting legacy as Raptors? Sam Hengeli: Casey should be remembered as the best and most consistent coach in Toronto’s history. The Raptors were never an annual playoff threat before he took over in 2011. Lowry and DeRozan’s legacies should be the same as Mark Price and Brad Daughtery when they were in Cleveland in the late 1980s and early 1990s. Great players but not good enough to get you over the top. Lowry and DeRozan represented a cultural movement in Canadian basketball, expanding the game globally. They should be celebrated for what they did as a team and an organization. Their work won’t go unnoticed. ← Has Russell Westbrook Damaged the Oklahoma City Thunder?